Check out whats new on South Asia Region's AIDS website! Suspending Judgment - a training course for health workers on stigma reduction, New Delhi, Jan 17 - 19, 2011. National training course specifically aimed to reduce stigma in the health care setting. All training manuals and tools available, on request. South-to-South Knowledge Exchange on Harm Reduction, Bangladesh and Maldives high level delegations visit Malaysia, Jan 2011. And the response from #socents is exciting! 7 weeks of outreach, 50 days of meeting, engaging, dialoguing with some of the brightest, most committed minds involved in creating social impact across India. And an overwhelming 264 proposals received from organizations seeking funding to scale their projects with support from the India Development Marketplace 2011. The response is extraordinary given the fact that this version of the India DM is focused on enabling Scale. Therefore these are not start-up ideas – but instead are more mature models that are already demonstrating at least 2 years of operational existence, a movement towards financial sustainability, a reasonable clarity in their unit costs and a demonstrated and valuable social impact that can be replicated. Traveling with the India DM 2011 team, meeting social enterprises that were trying to breakthrough the traditional mould of development, I was struck by the way technology was being leveraged. It came through as such a critical tool – an enabler that could single handedly shift the equation and bring possibility to the remote rural parts of India – shifting the balance of development and growth. Bringing in possibilities , empowerment and real access. Here is an illustrative sample of ideas that highlight the kinds of technology applications that are evolving as a result of entrepreneurial activity powered with a social spirit. Gyanshala’s innovative pedagogy and Chaitanya Gurukul’s integration of technology and web content into education are building a strong case for innovation in getting effective education to the most remote and poor corners of India – by focusing on whats essential. 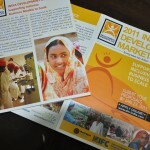 Manav Seva Sansthan (MSS), 2008 Development Marketplace winner, recently won the STAR Impact Award. The award recognizes and supports local organisations that achieve excellence in the provision of services to disadvantaged children and that demonstrate effective management practices. Winners receive $100,000 in unrestricted funding, tailored consultancy support and media training. Under the Development Marketplace project, MSS works to provide excluded women and their families with legal rights to land through a collective/group land ownership rights model. The concept of collective land ownership for ensuring women control of land and building women’s leadership in agriculture based livelihood is unique in the Indian context. MSS is successfully carrying out “collective land and collective farming” with small farmers using Low External Input Sustainable Agriculture (LEISA) techniques. BP Agrawal is a double Development Marketplace winner. He won in 2006 with his Sustainable Rainwater Harvesting project and in 2007 with Walk-In Clinic for the Masses. This is being reposted on the occasion of Blog Action Day 2010. Visit Sardarpura, a sleepy Indian village 150 km (93 miles) southwest of New Delhi. Women have gathered at the village square. They are tapping empty matkas (earthen water pots) to produce melodious beats. One is humming the “lament of bride": "Dhola thare desh men, moti marvan aant. Daroo milti mokali, paani ki koni chhant." Sudden commotion drowns the melody. Children start running in the dusty streets and yelling “Pani Aagayaa. Paani Aagayaa” (Water has come! Water has come!). Women wrapped in vibrant colors rush with their matkas resting on their waists. The water tanker had just arrived — after two weeks. That is the perennial scarcity of drinking water in rural India!